The better a team communicates, the more efficiently it operates. 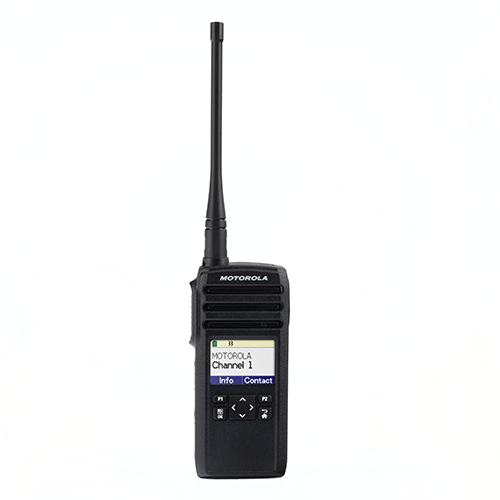 Motorola DTR Series digital on-site two-way radios are the power tools that enable that communication. Unlike alternative technologies, there are no monthly fees. No service towers. No per-minute charges. Moreover, these durable on-site two-way radios help businesses keep operations on schedule, maximize job shift productivity, enhance security and increase overall customer satisfaction. Digital audio quality – that stays loud and clear everywhere you have coverage. Scroll list of frequently used groups, and a recent-calls list. * Coverage will vary based on surrounding terrain and conditions. ** CPS is available as free download. Windows® XP, Windows 2000 compatible, separate USB cable required. DTR Series radios give you peace of mind and keep your team focused on the task at hand, by making your communications more private. communication when compared to standard analog radios. recipient receives an alert - either audible or vibrating - and their radio displays the caller’s ID. on the same group ID and channel can hear communications. edge of coverage – without static or dead zones. paperwork and licensing applications and reduce your costs by saving on frequency and radio licensing fees. Copyright © 2019 ProMarketing Inc., All rights reserved. Motorola and the Stylized M Logo are registered in the U.S. Patent and Trademark Office. All other product or service names are the property of their registered owners.